At this moment, there is a crowd of freedom lovers gathered outside the Migration Office Detention Center in Stockholm. We have only a few hours’ time to save Mohammad Sirvan Foroutan from the danger of deportation to Iran. 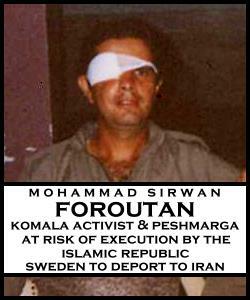 Mohammad Sirvan Foroutan was connected to Komala (Kurdistan Organization of the Communist Party of Iran) before leaving Iran and was engaged in clandestine activities [against the Islamic Republic of Iran]. In the year 2004, when he was exposed, he left his residence in Sanandaj and joined Komala’s organization in Iraq. The Swedish Immigration Office, despite all of our efforts and the confirmations of political organizations regarding the authenticity of Mohammad Sirvan Foroutan’s claim, has decided to deport him to Iran. He is going to be deported from Arlanda Airport tomorrow, Friday, at 14:00. In order to protest the implementation of Sirvan’s deportation sentence, tomorrow, Friday at 9:00am, we will gather urgently. We need to stop the deportation of Sirvan by any means. His life is in danger. On Thursday, 5 May 2011, Aftonbladet has published an article based on a letter written by the Federation and sent to the European Court; this article has the signatures of three Members of Parliament under it. Yesterday a protest was held in Sweden to demand a halt to Sirvan’s deportation. By the end of the demonstration, it seemed that the Migration Office had agreed to review Sirvan’s case; however, it seems that the decision to review his case has not been communicated to the police! Today there were two smaller demonstrations outside “Migrationsverket” in Stockholm and Göteborg at 8am. He is expected to be put on a flight from Flen to Stockholm today; he will be forced onto a flight from Stockholm to Tehran on Friday. Ahmad Fatemi and anyone else available will be spending the day on the phone/fax/mail trying to talk to people from UNHCR and Amnesty to the Swedish Parliament. Any help from people with blogs, on facebook, on twitter, etc. to also send the urgent message that Sirvan must NOT be deported is appreciated. Sirvan has faxed his last will and testament to one of our members, who hopefully has convinced Sirvan not to hurt himself in protest. He has said that he will not accept deportation no matter the cost. This is bad – what Sirvan is experiencing is torture, and it is not much different from the Islamic Republic’s mock executions. We need to stop this inhumane behavior by governments; sending refugees back to persecution and execution in Iran is a crime. TAKE URGENT ACTION: 1) Call and 2) Write to the Swedish Migration Office and demand an immediate halt to the deportation of Mohammad Sirvan Forutan, an activist against the Islamic Republic regime and member of Komala’s Peshmarga. Mohammad Sirvan Foroutan, born on 25 June 1977, case no. 10859037, is an Iranian asylum-seeker who has sought refuge in Sweden from persecution by the Islamic Republic of Iran. As a member of Komala (the Kurdistan Organization of the Communist Party of Iran ), Sirvan has for many years engaged in both political and armed struggle against the Islamic Republic of Iran. if Mohammad Sirvan Foroutan is returned to Iran by Sweden, it will be tantamount to Sweden executing him. I demand an immediate halt to Sweden’s intended illegal deportation of Mohammad Sirvan Foroutan, who is at clear risk for execution if returned to the Islamic Republic. Refugees have a right to asylum, protection, and no forced return. Yet in this case and in many others at clear risk of persecution if forcibly returned to Iran, Sweden has grievously violated the rights of asylum-seekers. Sweden must not only immediately halt the illegal deportation of Mohammad Sirvan Foroutan, but must immediately cease all deportations to Iran. We have received notice that once again, the Swedish government intends to send a refugee at clear risk of execution back to Iran. Please read the below letter from Mohammad Sirvan Foroutan, an activist against the Islamic Republic regime and member of Komala’s Peshmarga, who is at imminent risk of illegal deportation to Iran by the government of Sweden. Then take action to save his life by writing to the Swedish Migration Authorities on behalf of Sirvan; a model letter and email addresses are below. My name is Mohammad Sirvan Foroutan, born on June 25, 1977 in Mariwan, Iran. I was under persecution [by the Islamic Republic] since 2004, as a result of being exposed while disseminating flyers published by Komala (Kurdistan Organization of the Communist Party of Iran). My colleague was arrested and I managed to flee to the other side of the border into Iraqi Kurdistan and join the Peshmarga organization of Komala (Komala Peshmarga forces are the armed forces fighting against the Islamic Republic since 1979, which, at the moment and since the establishment of the Kurdistan Regional Government, due to diplomatic relations and other concerns, do not engage the Islamic regime’s armed forces inside Iran). I was shot at by accident and hit during military training and lost my right eye. I eventually left Iraq to go to Turkey, then to Greece, and then from there to Sweden; I have been living in Sweden for the past 4 years. I have applied for political asylum, and my application has been rejected. I was arrested by the Swedish police 45 days ago and have been detained since. My deportation is planned for 5 May 2011. As a political activist I have resumed my activities even here in Sweden and in connection with Komala. Letter from Komala declaring Mohammad Sirvan Foroutan to be one of their members, active in political and armed struggle against the Islamic Republic, and someone whose life would be endangered upon return to Iran.